With Father’s Day less than a week a way, if you haven’t decided on a gift for dear old dad, then you might start feeling the pinch pretty soon. However, if your father’s a coffee hound, then you’ve got nothing to worry about. 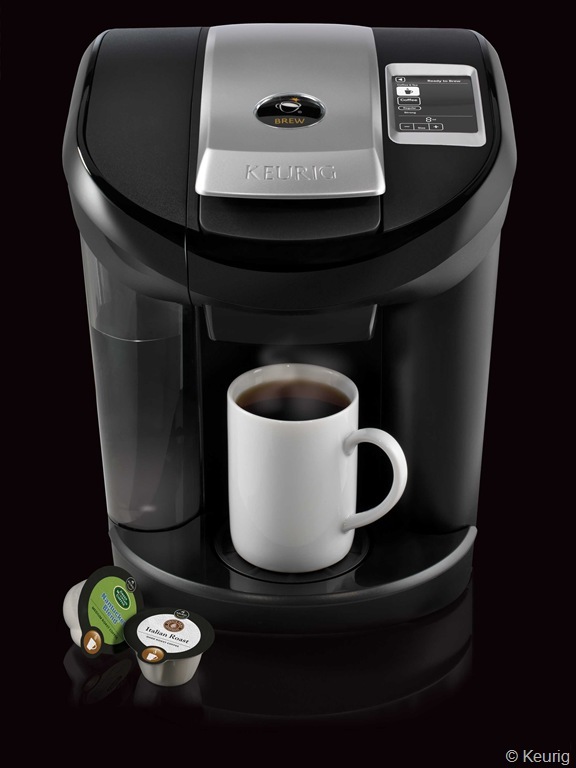 Keurig recently debuted its newest one-cup brewer – Vue – which promises to brew stronger, brew bigger, brew hotter. One way it accomplishes these tasks is through the easy to read, cinch to use color LCD touchscreen located on top of the brewer. Does dad need a serious java jolt when he wakes up? Not a problem. First, the Vue is programmable, so it’ll be turned on and waiting for him. He’ll easily brew a stout cup of coffee simply by touching “strong” on the screen. And with the touchscreen, there’s no need to program a size – touch the plus or minus signs to get the exact amount he wants each time he makes a cup. But if he wants all of the details taken care of, then he easily can program Vue. It’s the same process with the temperature. The handsome Vue is so user friendly that it allows bleary eyed users to control the temperature range between 187 and 197 degrees in 1-degree increments, without missing a beat. And if he’s the kind of guy who can’t head out of the door without coffee in hand, then he’ll be thrilled that Vue brews up to an 18-ounce travel cup. The Vue also delivers tea, cocoa, iced beverages and, unlike Keurig’s original brewers, this new model makes frothy drinks. Keep in mind that the Vue doesn’t use K-Cups, it uses Vue cups instead. They’re slightly larger, and come in different sizes for specific beverages and, unlike K-Cups, Vue cups are recyclable if your city takes #5 plastic. Vue has a list price of $249.99 (don’t pay a penny more), and you can find it at Bed, Bath & Beyond, Kohl’s, Macy’s, and amazon has it for $229.45, with free shipping. Oooh! A challenge. I like that. So, let’s say that your father is a single malt whisky guy (the word Scotch comes from Scottish whisky, by the way), meaning he likes his hooch to come from only one producer in one place. I don’t think you’d go wrong with Glenlivet, Glenfiddich or Aberlour. The first two are easily available and come in various price ranges. Now if your father likes to mix it up a bit and drinks a blended Scotch, you have some nice choices there as well. Check out Johnny Walker Black Label blended whisky, Chivas Regal and Famous Grouse Gold Reserve 12. Any of those should get you a big thank you on Father’s Day. Let me know how it works out. Thanks for reading!